JACKSONVILLE -- Looking back, Amy Buggle wonders that she had the gumption to take on a day care ministry for special needs children and their families. The sum of her experience was four years in public schools as a special needs teacher. "There were people with a lot more training than I had," she says. "But when God wants something done, He pretty much gets it done." 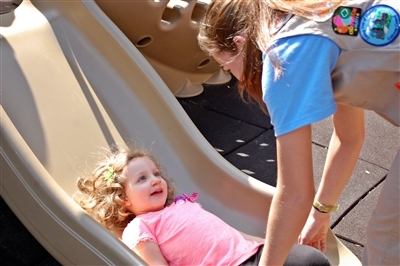 With help from a volunteer, a youngster enjoys the playground at the Developmental Learning Center. Photos from DLC Nurse & Learn. The DLC (Developmental Learning Center) Nurse & Learn program that Buggle founded in a Sunday school room at Murray Hill UMC recently celebrated its 25th anniversary. Since 1989, more than 2,000 children have attended the Jacksonville-based center's inclusive day care and after-school programs. It is going strong with a combined enrollment of about 130 children at Murray Hill UMC and a second location at Lakeshore Presbyterian Church. There’s also a waiting list. 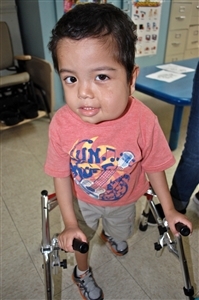 The center provides speech, occupational therapy and nursing care for special needs children from birth to age 22 who have disabilities, including Down syndrome, cerebral palsy, microcephaly and seizure disorders. Several years ago, DLC merged with Murray Hill's preschool and became fully inclusive for children of all abilities. Scholarships are available, and some families qualify for reduced fees based on income and ability to pay. The North East District promotes the ministry by encouraging local churches to donate and setting aside time for presentations at district events. Buggle sees divine guidance in all that has happened. "It's so wonderful that God decided to put this in a church," she says. As a public school teacher, Buggle knew the difficult choices facing parents of children with special needs and their lack of options. Even finding places for haircuts could be a problem. She began thinking about a day care center after serving on a committee to develop a resource pamphlet for parents. Young Andrew is among hundreds of children with disabilities who have found their way to DLC, a preschool and after-school program started at Murray Hill UMC. "It dawned on me some of our families were unable to work," she says. "It got my wheels spinning and thinking about how unfair it was. We're telling (parents) you can't work. You're going to stay home and take care of the children." Charlene Ennis faced that dilemma at the birth of her now 10-year-old son, Nathaniel, who goes by Nate. He is tube-fed and has physical as well as learning challenges. She enrolled him at DLC when he was a year old. "It has truly been an amazing experience," says his mother. "It allows me to be able to work full time so I can provide for therapy and what I need to do for him." Nate is enrolled in fourth grade at Mount Herman Exceptional Student Center. He attends DLC before and after school. "He is slowly starting to walk," Ennis says. "He actually says 'hey' now. He's pulling up on furniture and walking. He loves music." Ennis' only other option for Nate when he was a toddler was a center she visited in south Jacksonville. "I left in tears. It was a dark trailer," Ennis says. "The kids were just lying there." Her first visit to DLC was a total contrast. "As soon as I walked in the door, it was lively and energetic," she says. "Right from the start they helped me get to the acceptance of my son the way he was." Buggle would like to see more centers like DLC open, especially on the city's south side. But she says, "Not a lot of people have jumped on the bandwagon to run a program like this." Buggle's journey to fulfill her dream took diligence. She was turned down by other churches. And then, at a friend's suggestion, she joined Murray Hill UMC in 1989. That same year, Rev. William “Bill” Fisackerly III was the newly arrived pastor at the church when staff member Russ Peters introduced him to Buggle. Peters, who had brothers with disabilities, was sympathetic to Buggle's plan. Fisackerly also had a connection to special education. His mother, Hester Fisackerly, in the 1920s started the first special education classes in Duval County's public schools. Her program became a model for the rest of the state as districts adopted special education programs. Even school officials from California visited to learn from Hester Fisackerly. "I told my people we should give her a chance," says Fisackerly, who at age 84 is retired and living in Lakeland. DLC graduate "Brandon," flanked by the center's founder, Amy Buggle, left, and teacher Erley Wood, enjoys a summer camp outing. The church opened space in its Sunday school rooms, rent-free. "It was frankly unused space," Fisackerly says. The day care center didn't get off to an auspicious start. Buggle had three students. "My thinking was completely wrong that families would rush to our doors and pay a child care fee," Buggle says. "They were all broke. Many had good careers but lost them due to financial difficulties." She realized the center needed a scholarship program and outside funding sources. Over the years, about $3 million in scholarships has been handed out. Grants, donations and various fund-raising events, including an annual golf tournament, help bring in revenue. The Jaguar Foundation, Jacksonville Children's Commission and United Way are contributors. Finances continue to be a struggle year to year for an annual budget of $750,000 to $800,000. The ties to the North East District as the program expanded and "mainstreaming" the center's teaching curriculum have helped. "It opened up a lot of funding for us," Buggle says. "It completely changed the atmosphere." The interactions of special needs students and non-disabled students are part of the learning experience, Buggle says. "We wanted to show all children are equal in the eyes of God. There is a lot more activity in the classroom. 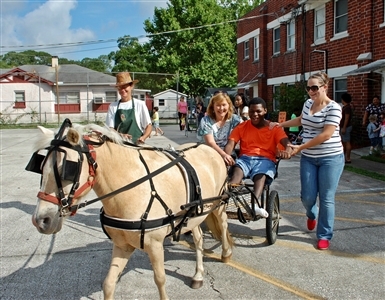 It teaches them so much about acceptance and self-esteem." Buggle credits her staff of about 30 and the volunteers from the church and community with the center's success and for their personal sacrifices. "My staff makes very little compared to what they would make in the secular world," she says. "The families are the big deal. They are the ones so helpless and lost." For more information about DLC, click here. * Kathy Steele is a freelance writer based in Tampa.